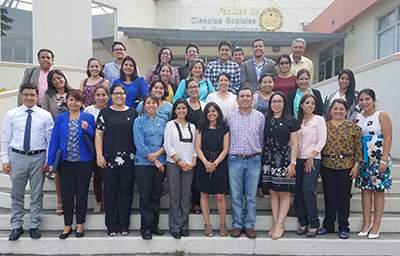 Rowland School of Business Associate Professor of Organizational Leadership Helena Knörr, Ph.D., taught a full-day workshop April 16 to more than 40 faculty members in the School of Social Sciences and Humanities at Escuela Superior Politécnica del Litoral in Guayaquil, Ecuador. According to Knörr, Escuela Superior Politécnica del Litoral is one of Ecuador's highly-ranked public universities. Knörr’s workshop titled “Innovation and Social Entrepreneurship in the Context of Multidisciplinary Approaches,” focused on how professors can incorporate their social innovation entrepreneurship projects when submitting proposals and applying for grants. Additionally, Knörr gave a motivational speech April 17 to approximately 35 women entrepreneurs from socioeconomic-disadvantaged communities in Ecuador. Knörr added: "Through a multidisciplinary collaborative approach, my experience has shown that universities, communities, businesses and government, can solve complex social problems. The model I taught is known as Triple Helix, and allows building alliances towards action. It raises awareness about our immediate context, and it is a way to let professors and students put leadership theory into practice". Explore the organizational leadership and M.B.A. programs at Point Park University. Meet the Rowland School of Business faculty, request information or apply online.